Volatile mix of training, blogging and scientific journal review…. I must admit balancing training, full time work, starting up a website and perhaps the occasional bit of social life has been a little tricky. However, this is not to make excuses and below you will find a brief summary/review of the literature covering cardiac damage in endurance athletes. As you may be aware from my ‘About’ page I hope to run a pilot study into the effects of a Deca Ironman triathlon on cardiac function in June 2014. My initial review of the studies published in this area have suggested that there is a strong case for a publishable report containing data from baseline and immediately post race, 24 hours post-race and 48 hours post race including cardiac MRI with late-gadolinium enhancement, blood tests: BNP, NT-proBNP, ST2, Galectin-3 & biochemistry profile. Not only will this provide a compelling dataset for the literature in endurance sport – and I would hope to move forward towards funding for a larger population study – it would be the most detailed profile of athlete cardiac output in the Deca Ironman or any ‘ultra’ endurance race format. 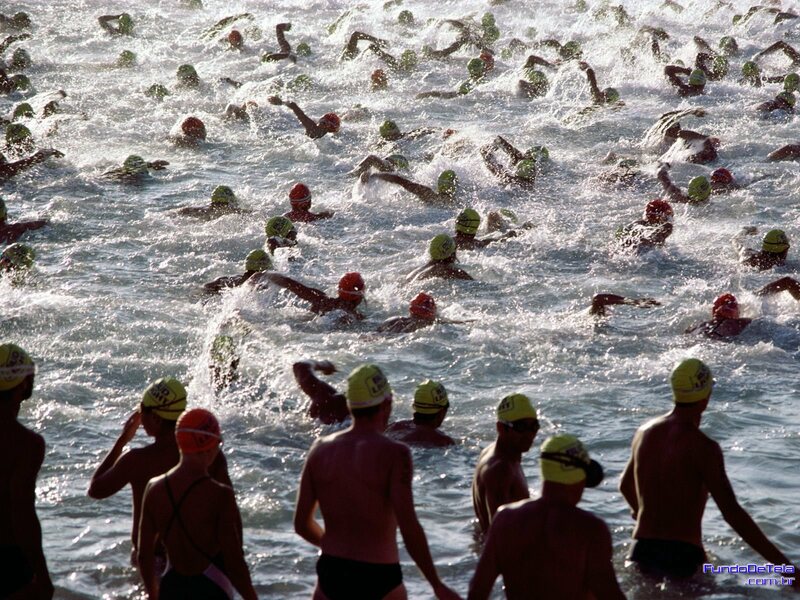 With the growing public interest in more extreme triathlons, there will certainly be more investment to study appropriate training plans for sports enthusiasts (not necessarily top level athletes) in order to reduce the impact of any negative health effects of intense and prolonged endurance exercise. It is clear from the studies noted below that although there is clearly cardiac damage from endurance sport – and this has been demonstrated in marathon runners for a number of years – this form of exercise can induce physiological functional and structural cardiac adaptations, which drastically reduced strain on the heart. By studying my own cardiac output over the course of a few months next year I would assess how my baseline changes as my training progresses, the impact of the Deca and review what damage could be inflicted. Of course this study is not intended to discourage athletes from taking up this sporting pursuit (there are numerous studies that demonstrate the anti-cancer, mental benefits of ‘killing’ yourself up a hill side on a Sunday morning – yes I am drifting between science ‘speak’ and casual blogging!) only to make them aware of its health impact and be best prepared for potential implications – i.e. build up the intensity of a training schedule over a matter of months. If you are a research institute interested in this study and would like to be involved both academically and/or through financial support [both for this investigation or future projects] please drop a comment below or an email at longworn (at) tcd (dot) ie (note; email comes from my time in the Biochemistry Department in Trinity College Dublin). I have already discussed the study with some leading researchers in the field and I have been offered remote academic supervision (which I am very grateful for and if you are reading I will drop a formal proposal asap, sorry for delay). However any further assistance is always welcomed. The strain on the heart during (ultra) endurance exercise is considerable, with the organ exposed to increased mechanical work, elevated core temperature, altered pH, increased levels of catecholamines and exposure to reactive oxygen species [Dawson E et al 2003]. It was concluded in a review by Scharhag J et al (2013) – which discussed the main cardiological findings in competitive athletes – that this endurance exercise induced physiological functional and structural cardiac adaptations which in the majority of cases, evident from epidemiological data, lead to positive effects on life expectancy. The frequently reported Athlete’s heart, a condition characterized by physiological, harmonically eccentric hypertrophy of all cardiac chambers and which typically affects endurance sports persons, was believed to be ‘rarer than generally thought’ from their review of the literature. However several studies have shown that even for the most practiced athletes, endurance competition has been associated with arrhythmogenic cardiac remodeling of the right ventricle (including fibrosis). La Gerche et al (2011) demonstrated that whilst studying 40 athletes at baseline, immediately following an endurance race (3-11h duration) and 1-week post race, that intense exercise of this nature caused acute dysfunction of the RV, but not the LV. Interestingly short-term recovery appeared complete but in the most practiced athletes there was chronic structural changes and reduced RV function. 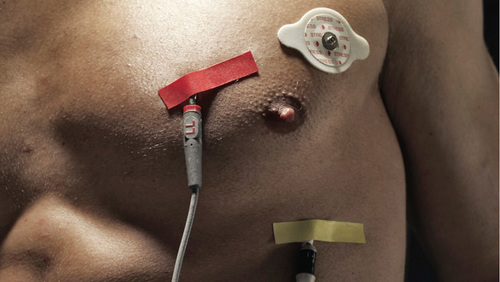 These observations are consist with the findings highlighted in the special report in Preventive Cardiology – Cardiovascular Damage Resulting from Chronic Excessive Endurance Exercise – from Patil HR et al (2012) which remarked on veteran extreme endurance athletes having patchy myocardial fibrosis from recurrent injury particularly in the atria, interventricular spetum and RV; which potentially creates a substrate for atrial and ventricular arrhythmias. 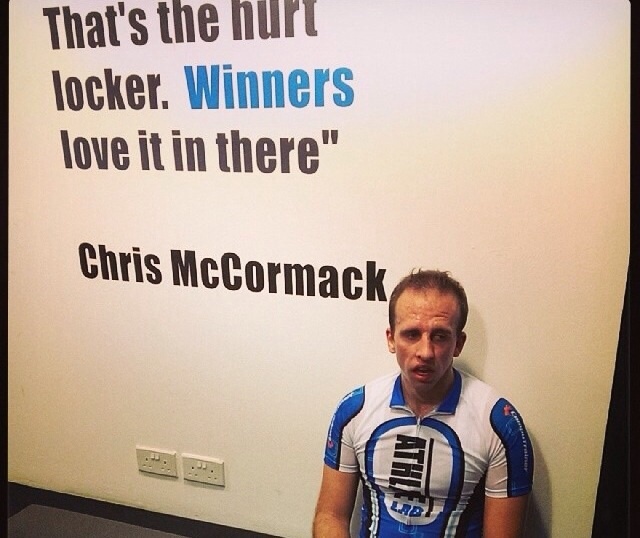 2004 Olympian Champion in Triathlon – Atrial fibrillation secondary to heart scarring. Cardiac Arrest in 2004 – Diagnosed with Ventricular Tachycardia and has a Pacemaker fitted for life. (Multiple Triathlon World Champion) – Ventricular tachycardia, he has undergone nine open-heart surgeries from 2001 until 2003. Tour de France Pro cyclist – potentially lethal Heart Arrhythmia. As a consequence of the findings above, of particular interest in recent literature was the long-term outcomes and mortality of elite endurance athletes. Marijon et al (2013) observed a significant lower mortality in French participants of the Tour de France (1947-2012) when compared to the general male population. Importantly however it was noted by the authors that the results didn’t allow a detailed assessment of the positive effects of high-level sports activity and selection of healthy elite athletes vs any potential deleterious effects of excessive physical exercise or alleged doping. Yet it appears in the literature that there is solid evidence for a mean increase in life expectancies in elite endurance athletes which is mainly explained by decreased CV mortality. For example an increased life expectancy was found in world class Finnish male athletes from the Olympic games, World or European championships between 1920-1965, and this was particularly pronounced in long distance running & cross-country skiing (75.6 yr as opposed to 69.9 yr in the reference group) [Sarna S et al 1993]. Arguably, and many investigators have commented on this, that this increase in life expectancy could be a result of a ‘healthier’ life – by that I mean exercise, diet, etc – post competition which is more beneficial than any potential damage to cardiac function throughout their racing career. 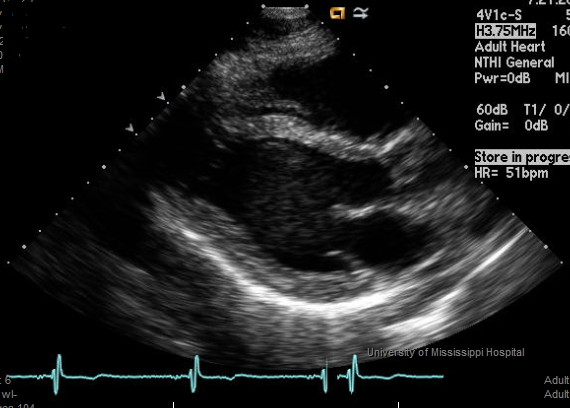 Echocardiogram image from http://www.athletesheart.org. The author of the blog Larry Creswell has some extremely interesting posts – check it out! So how would you even go about testing for cardiac function in endurance sport? Additionally you can measure specific biomarkers for cardiac damage. Cardiac-specific troponins (cTnT and cTnI) have become accepted standards to serologically identify myocardial damage and are used clinically to diagnose acute myocardial infarction [Alpert et al, 2000]. cTns elevation is apparent in conditions resulting in significant cardiac stress in the absence of obstructive coronary disease [Jeremias A, Gibson CM 2005]. Numerous studies have demonstrated that prolonged strenuous exercise promotes the elevation of these cardiac biomarkers, with serum cTn elevation central to the diagnosis of actue coronary syndrome [Shave et al 2010]. N-terminal probrain naturetic peptide (NT-proBNP) has also been measured alongside cTNT in assessing cardiac damage. Neilan TG et al (2006) performed these two measurements alongside echocardiographic measurements of cardiac function on 60 recreational runners before & 20 minutes after the 2004 & 2005 Boston Marathon. Changes in serum cTnT and NT-proBNP were dramatic – 40% of cTnT values post race were at or above the level at which the team would diagnose myocardial necrosis. NT-proBNP roughly doubled after the race – and it correlated with changes in cardiac function, including reductions in RV systolic function correlating with increased cTnT. Notably, as referenced earlier in this brief, changes in serum cTnT and NT-proBNP levels and cardiac performance was most marked in runners with the least prerace training. [Interesting to see what effect training (properly) for a Deca Ironman will do to prevent this rise in cTnT and NT-proBNP, will I be doomed anyway because of the sheer intensity involved?]. As you would expect the research in ‘Marathoner’s Heart?’ (as described in the Editorial of Thompson PD, Apple FS & Wu A, 2006) has been quite extensive. Being a triathlon we must also reference the other two disciplines cycling and swimming (haven’t got this discipline on my desk presently, will have to get back to you on this!). Serrano-Ostariz et al (2009) noted that in a cycle-touring event exercise intensity (HR) was responsible for the cTnI increase and that race time increased NT-pro-BNP. Although it was noted by the authors that to standardized exercise trials further investigation would be required in training status, exercise time and intensity of post-exercise increases in these two biomarkers. So academic precedent describes how there has been numerous peer-reviewed studies describing cardiac damage using biomarkers and cardiac MRI. I have pulled out a few endurance sport studies here – marathon, cycling – but it appears there is limited athlete cardiac profiles for Ironman competition and furthermore in ‘ultra’ distance triathlons (there has been some great studies of course, I will put together a literature review on this in the coming days – or with limited internet connection in Burma over Christmas, post New Year!). Finally I don’t believe this Deca study will investigate as far as preventative measures (not yet anyway) but interestingly Siegel AJ (2013) found that the use of pre-race low-dose aspirin is evidence-based by validated clinical paradigms to protect middle-aged male runners from acute cardiac events during races triggered by high, even if transient, atherothrombotic risk…….definitely more to investigate here I think. Right that is enough post-work science for today…..any thoughts/comments please let me know below. Do share with your ill prepared running buddies, particularly in the post Christmas period! Neilan TG et al, Myocardial injury and ventricular dysfunction related to training levels among nonelite participants in the Boston Marathon. Circulation. 2006; 114:2325-2333. I’m a competitive ironman, starting racing after doing no exercise for 36 years. I quit smoking and decided to get healthy. I have done 4 ironman, countless 70.3 races, went to 70.3 worlds, qualified for Boston etc. and….I’m a research nurse in Texas. I can help in any way you see fit. Think of using nattokinase instead of aspirin.. No risk of gut and liver damage.